One of the most revered leaders in modern history, Winston Churchill’s life is revisited in this extraordinary feat of historical literature. 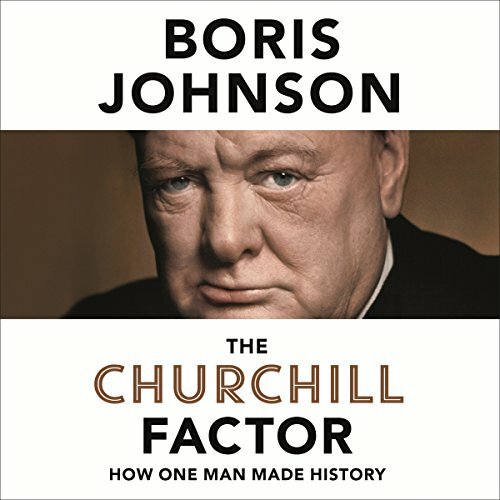 Boris Johnson – politician, historian, journalist and author of The Churchill Factor has written the most thorough and engaging Churchill biographies available today. In this full and unabridged audiobook, narrated by well-known British actor Simon Shepherd, listen to the makings of this incredible man whose achievements and decisions paved the way for modern Britain. An absolutely necessary addition to any library. It is truly inspirational and informative listening. Available now from Audible. On the eve of the 50th anniversary of Winston Churchill's death, Boris Johnson explores what makes up the 'Churchill Factor' - the singular brilliance of one of the most important leaders of the 20th century. Taking on the myths and misconceptions along with the outsized reality, he portrays - with characteristic wit and passion - a man of multiple contradictions, contagious bravery, breath-taking eloquence, matchless strategizing, and deep humanity. Such an enjoyable listen. It does jump all over the place in regards to content but that's probably what keeps it so interesting, it's not chronological but tells you snippets from all facets of his life throughout each chapter. Each chapter has a theme /topic so it's still a very well structured story. The narrator has a great voice, a very easy listen. I'm so glad I started listening to it when I had a 4 hour drive ahead of me as it kept me thoroughly entertained for the whole drive and made me look forward to the drive home again so I could keep listening. Loved it, cannot recommend this book enough!! !